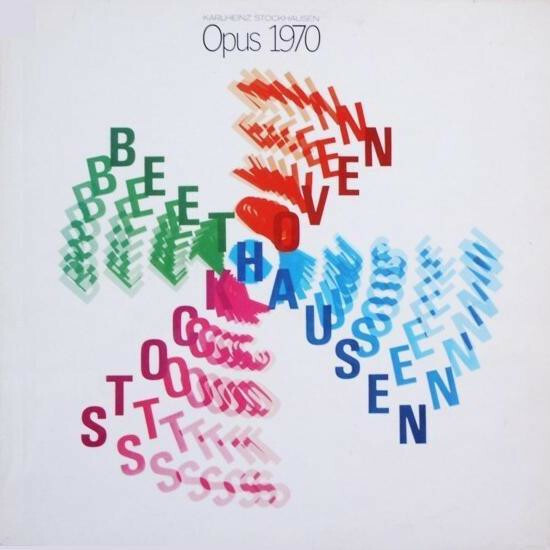 For many years the rāra avis of the Stockhausen discography on CD was Beethoven Opus 1970. So having a digitally remastered version on Text CD 23 was pretty great. I had no problem double-dipping there. However, I do sometimes feel a bit underwhelmed after the excitement has died down, which is perhaps why it never came out on a "Stockhausen Edition" CD. For those not familiar, Beethoven Opus 1970 was a one-time affair where Group Stockhausen (consisting of piano, tam tam, amplified violin and electronium) played KURZWELLEN, but improvised (sorry, "plus-minused" ) against remixed tapes of Beethoven instead of shortwave radio. As a big fan of electroacoustic free improvisation using turntable (see Otomo Yoshihide, Christian Marclay, etc.) I knew I had to have this as soon as I heard of it. And after becoming a big Beethoven fan it became an even juicier affair. Any other impressions, or info on why KS held this back? I have no idea why this was not released as part of the main CD edition, but others might know more than I do. I only have it on vinyl (at this stage), and unfortunately it's a very crackly old copy (which a friend found for me at a second-hand record store), which gets in the way of hearing it properly. But I enjoy it. As with all of the plus-minus pieces, I love trying to guess what the performers are doing in response to the events they hear - trying to follow the score and see which parameters they are responding to and how. I can rarely pick it up but I love the challenge. As for the piece itself, I do enjoy it a lot - but certainly I prefer the other performances with shortwave radios: but in some ways I feel it's unfair for me to judge it too much when my recording of it is really so poor. I really need to buy all the Text CDs but, as anyone who knows me would know, I would have to buy them all and would feel hopelessly unbalanced and incomplete with just one or some. Completism is wonderful, but expensive! First of all, my spelling is getting worse with age. Opus not Opos (which sounds like a Greek car service or something). Ian, I may actually like the vinyl version better because the surface noise gives the whole thing a kind of unifying factor. Actually I like my Cage on vinyl for the same reason, all those rests are "filled" with aleatoric noise! Still, Opus 1970 definitely has a few moments to me where I can sense the guys just look at each other and throw their hands up in the air. For example, when Ode to Joy comes on - Boje is like, screw it: "BEEP - BOOP". But you know me ... I can't possibly have all those numbers without all the rest. As it is, I am living in the unspeakable imbalance of having the scores to only two-thirds of KLANG and less than half of the KLAVIERSTÜCKE! But the Text CDs are on the list! Winrich Hopp did indeed write quite extensively about Stockhoven-Beethausen in his dissertation. He provided a detailed analysis of the collage tape of Beethoven's music, and also analysed two extended passages from the recording. Those excerpts from the recording are included on the CD that comes with the book. One thing that attracts me to this version of Kurzwellen is that because the material is all so familiar (well, perhaps the readings from the Heiligenstadt Testament are not quite so familiar as music! ), it is comparatively easy to follow the processes of imitation and transformation. I cannot imagine that this would be a reason for Stockhausen's later rejection of this version, since he had a didactic streak and was always keen that listeners should be able to hear the unfolding of his compositions. Perhaps the problem, for him, was the uniformity (one could even say "monotony) of the material, on the one hand, and the corresponding reduction in unexpected events that would challenge the performers' skills on the other. One way or the other, I used to listen to the vinyl recording quite often, but my copy somehow developed a scratch on one side that would make the tone-arm skip, and this spoiled the experience. I was very happy when the CD was issued, though I have only listened to it once or twice since acquiring it a couple of years ago. Again interesting insights from everyone on this, and enough to convince me to delve more deeply into this piece, even if to hear it in a better way than my extremely poor quality vinyl pressing I need to start the irreversible dive into the Text CDs. I am really interested in having a better understanding of how musicians imitate and transform material through the plus minus system, which at the moment is quite scanty. Sometimes I find this easier to decipher than other times - for example, Michael Vetter's complete SPIRAL is one where I can pick things up more easily than I can, for example, in the recordings of KURZWELLEN. Maybe, as Jerry suggests, STOCKHOVEN-BEETHAUSEN is a good place to further hone my skills in this. I am, as an aside, personally in awe of musicians who can really realise scores such as KURZWELLEN, where there are so many elements to respond to, in quite intricately defined ways, and other musicians to coordinate with, and in real time. To perform these pieces correctly, as opposed to turning them into quasi-improvisation, must call for a very finely honed skill that I imagine is very rare amongst both improvisation-oriented and notation-oriented musicians. Many thanks to Ed for his persistence and work in regenerating discussions here in this forum, which many of us have been neglecting for far too long! Following Vetter's integral recording of Spiral with the score is made infinitely easier by the minutely detailed tracking information given on the CD itself and in the accompanying booklet. The recently released recording of Kurzwellen by the C.L.S.I. Ensemble is also track-indexed in detail, and for that reason should also be easier to follow than otherwise might have been the case. I remember the seminar given by Vetter and Natascha Nikeprelevic at the 2011 courses, in which they tracked one of their two recordings with the score, one transformation at a time. While I have no difficulty following their performance on a section-by-section basis (because the seven sections are so strongly contrasted in character), I think I might have wavered a bit on the subsections. I regret that their seminar was not video-recorded, because it was so very revelatory. Yes, Jerry is absolutely right - and I should have given credit to those extremely detailed liner notes in the Vetter complete recording of SPIRAL. They put a bit of stress on my struggling German but, nevertheless, are an absolute godsend in terms of being able to understand what is going on and well worth the effort of the often-slow translation process in which i sometimes have to engage. Just as a small but pretty hilarious aside. I loaded that recording into my iTunes, as I have with all my Stockhausen CDs, so I can in turn transfer them onto my iPod for listening in the car, which I love to do on long trips between home and Melbourne. The 198 tracks were not automatically recognised by iTunes, so i had to manually name them. I thought it was easiest to just call them all 'Stockhausen-SPIRAL', with "Michael Vetter' as the artist. I highlighted all the tracks and entered those details. It seemed to take a long time to process and it was only afterwards that I noticed I hadn't just highlighted all the tracks of the double CD, but of my entire iTunes library. I now have 24,000 tracks in iTunes, all called 'Stockhausen-SPIRAL' and all performed by Michael Vetter. Wow! Fantastic! Twenty-four thousand "songs" in iTunes by Michael Vetter! I hope these include his own compositions/improvisations! An amazing performer, now sadly missed.